It is Friday, the weekend right?! For me, that doesn’t mean relaxing, far from. It means two crazy nights at work. I have been working mostly nights at Morimoto Waikiki, with the exception of a couple morning shift this week. It amazes me the difference in the type of shift I have when I work a lunch versus a night. Lunch shifts at Morimoto are mostly about setting up and prepping out food. Night shift are about putting out food, and lots of it. I am excited to be working nights after working lunches all fall at SALT, but it is a pretty crazy experience. Morimoto is a high-volume fine dining restaurant, which means go time all the time at night. The good thing is, I am LOVING it! The kitchen at Morimoto runs much more smoothly than my last job, which makes busy nights feel less chaotic. I love the excitement of the kitchen at night, not to mention the fact that time flies by when you are busy. What are your weekend plans? If you have some free time I have just the recipe for you. Rujuta over at Oblique Rays is our featured blogger for today with a delicious recipe for you to make on your days off! I know you are going to love this one. Have a great weekend! Oblique Rays started out as a blog where I would ramble on about the inconsequential happenings in my life. Over the years as I started to know more about me, I realized a penchant for all things dessert. This love for desserts is now my stress buster, and I’m happiest when I’m mixing flour and butter, and as a natural extension of this, Oblique Rays is now slowly turning into a food blog! 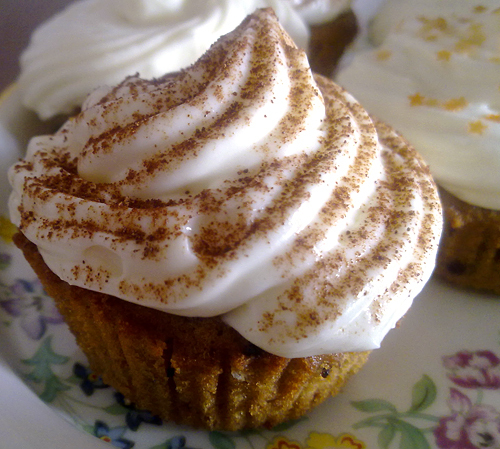 These cupcakes are my spin on Tiramisu, and have a rich coffee and cream cheese flavor! 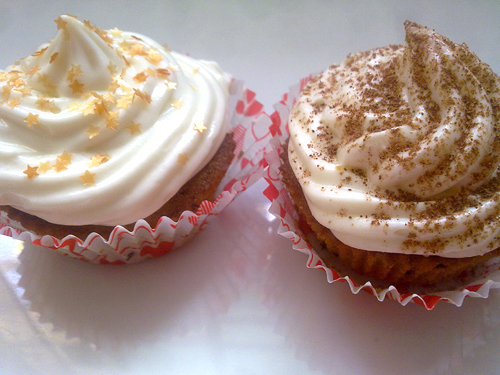 To make the cupcakes, preheat the oven to 350F (175C) whip the butter and sugar together. Add the eggs and vanilla and whip until the mixture is light. Add the instant coffee and mix. (You can use a lesser amount of coffee, but a stronger coffee flavor complements the frosting very well). Mix the flour and baking powder (dry ingredients) in a bowl. Now, slowly incorporate the dry ingredients and the rum alternately (in a dry-wet-dry sequence) with the butter mixture. Divide the mixture into 12 greased cupcake moulds and bake at 350F until a skewer comes out clean (about 15-20 minutes). For the frosting, whip the cream cheese and vanilla until soft. Slowly add cream and icing sugar, while whipping, until stiff peaks are formed. Pipe the frosting on cooled cupcakes. Dust cocoa powder on top. Thanks so much Rujuta! I have had such a sweet tooth lately for some reason and I would kill for these right now. If you or somebody you know would like to be a part of Featured Foodie Friday please e-mail me at savourthesenses (at) gmail (dot) com and we can get you scheduled! These cupcakes look heavenly !! One of my favorite desserts in a cupcake! These look wonderful! WOW! What a perfect cupcake! Your cupcakes looks truly delicious! And thanks for visiting my blog! Glad you’re enjoying your new job, though I bet it’s a crazy pace! Hi! Thanks so much for visiting me 🙂 This cupcake is the picture of perfection! Happy to have found you and am your newest follower. Have a great weekend! Yum! This looks and sounds delicious! I love the rich coffee and rum flavors you get in tiramisu and love the fact you were able to replicate them for a cupcake! How exciting working at Morimoto Wakiki, must be amazing! where did you find those star sprinkles?!?! they are fabulous! It’s almost the weekend–I’ll be working too. Wow, these cupcakes look fabulous–that frosting is almost pillowy! TGIF!!!!!!!!! I am glad I don’t have your schedule for this weekend. My head would explode. I will have to find time to try out these cupcakes. Divine! 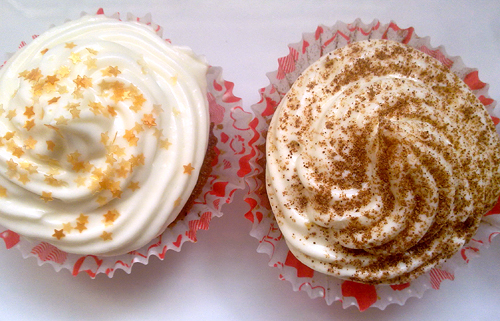 The only thing better than tiramisu is tiramisu in cupcake form! Love these. I bet they’re delicious! These cupcakes look delicious! So nice when you actually like your work! Your cupcakes look wonderful. I love the star sprinkles. Thanks for sharing. This looks delicious and its so creative! =) Thank you! I am loving it at Morimoto! and the cup cakes just makes me want to sit back and treasure every bite of! How cute and pretty too, and bet they taste just as good as they look. Have a great week. These cupcakes look amazing. They are beautiful too!